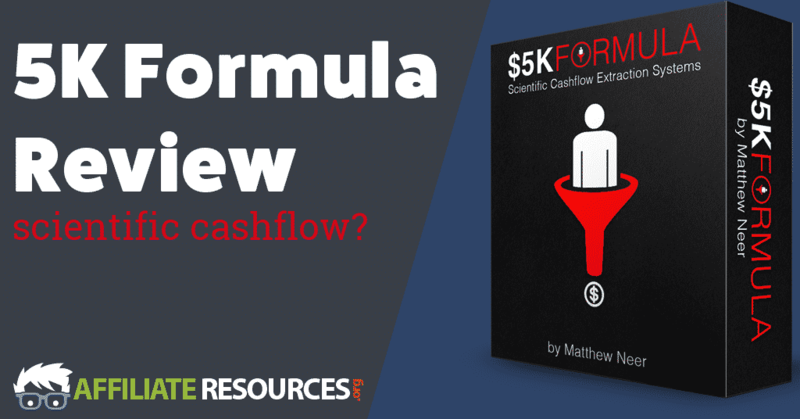 $5K Formula Review - A Scientific Cashflow Extraction System? How would you like to make $5,000 online for free instantly? You must admit that it’s a very tempting offer, and that’s what he $5K Formula promises to show you. Can it deliver on its’ promise, or would you be better off taking your time and money elsewhere? That’s what we’re going to be looking at in this $5K Formula Review. What is the $5K Formula? The $5K Formula is a program that teaches you how to use sales funnels to make money online. It also gives you access to a sales funnel to promote the $5K Formula to others. It was originally created by Matthew Neer in 2015 and promoted on a few different sites including the Warrior Forum via Warrior Plus for $19. It has now been relaunched in January of 2019 on Clickbank for $39.99. If you’re a little confused about what the $5K Formula is after reading the above paragraph, you aren’t alone. When I first came across the product, I had to look at it very closely to figure out exactly what was up for grabs as well. As you can see from the screenshot above, the sales page is very vague at first and simply promises to teach you a “new instant commission system that can make $5,000 on 100% autopilot for free!” To find out exactly what the product is, you must sit through the video sales presentation and as you can see in the screenshot below, it’s confusing as to what you’re buying until the very end. After watching the sales pitch, I realized that what’s being sold is a sales funnel system. If you’re not familiar with what a sales funnel is, let me quickly explain. 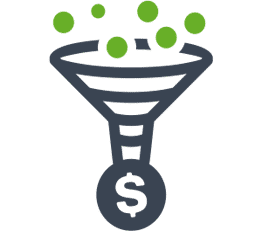 Sales funnels are a sales method that some marketers use to get you to purchase more expensive goods or services. Basically, they start you out with a free or very low-cost product and then send you through a series of additional products that you may be interested in. Normally, these products get more expensive as you continue. For that reason, they may also be referred to as upsells, since they’re a way to get you to spend more money than you originally planned. While upsells on their own aren’t necessarily a bad thing, many online product creators will often leave core pieces of their products out of the original offer so that they can then offer those pieces in the form of an upsell in their sales funnel. The result is that the information you believed you were receiving for the original low price (typically $1 – $7) from the initial product, is only available if you spend a lot more money (typically $30 – $50 or more) on the upsell inside of the funnel. Personally, I don’t like sales funnels unless the products that are being offered will help customers by providing more value, while the original product can stand on its own without them. An example of this would be trying to sell someone a pencil. If you sold someone a pencil, a good upsell would be things like a pencil case or a large eraser. A bad upsell would be the lead in the pencil as you must have it for the pencil to work at all. Unfortunately, this is what often happens with products online that are the beginning of a sales funnel. You buy the pencil (product or course) for a few dollars only to find out later that to use it, you must pay $50 for a piece of lead (paid traffic sources). Sales funnels on their own are confusing. Even veteran marketers may struggle a bit when it comes to setting up their first funnel. The main reason for this is that it can be challenging to learn a new skill, but Matthew would have you believe it’s far more difficult than it really is. Those statements sound scary if you’re wanting to make money online using funnels. The good news, it’s not true. Setting up your own sales or conversion funnels is very easy and anyone can do it. There’s no need whatsoever to hire a programmer to build a funnel for you. There are tons of resources online that will teach you exactly how to set your funnels up and find great products to offer in them. 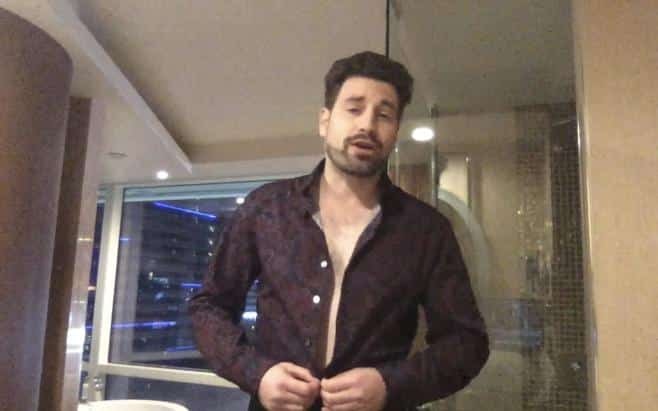 In the video, he also takes you into his bank because as he says, “online earnings can be faked, but cash can’t be.” The thing is though, yes, he goes into a bank and gets $5,000, but that money could have been from anything, nothing proves it was made online using a sales funnel. I’m not saying it wasn’t, just that it could have been made from his day job over a few months and we’d never know. Second, I also noticed while writing this review that the earnings shown on the sales page are interesting. As you can see below, when I looked at the page on two separate dates, I noticed that the daily income numbers are the exact same. $5K Formula does take a lot of the work out of the process as it gives you a funnel to drive traffic to. Just remember you can do the same thing on your own site in an afternoon. The training inside of the $5K Formula teaches you how to use the prebuilt funnel and gives you some ways to get traffic to your new funnel. The problem is that most of the methods it shows you for traffic generation are paid traffic sources and you can find yourself spending a lot more than you earn, if you earn anything at all. The sales page is very confusing and lists questionable earnings. Sales pages are there to make sales, but this one tries to make you believe that you must be a programmer to make a sales funnel. That simply isn’t true. While the idea of not having to host your funnel may sound appealing, it removes most of the control from you. If you can create a successful funnel, you may find yourself losing should the company decide to remove or seize it for any reason. If you create your own funnel, you maintain control. Most of the traffic generation tips inside of $5K Funnel are paid traffic sources. You can spend a lot of money trying to get traffic to offers that may or may not convert into sales. 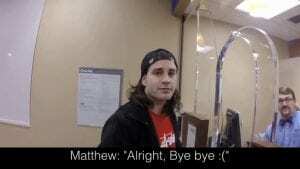 Many people who buy Matthew’s products complain about the lack of support they receive when they try to get it. Sales funnels are a great way to deliver products to your audience while making decent earnings for yourself. If you take the time to learn how to create a good funnel, track your conversions and then optimize your offer over a time to maximize the number of people who join your list and make purchases. While it may sound like an intimidating process, it really isn’t. While having a prebuilt sales funnel like the one offered by $5K Formula would put you a little ahead, over the long term, it’s more of a hindrance than a help. This is because when you take the time to learn how to build and implement the system on your own, you gain a skill that you can then use time and again for many different products in the future. Also, as mentioned above, when you create your funnel on your own hosting platform and use your own site for landing pages, you then own your funnel. This means that only you would have control over it and you wouldn’t have to worry about losing it later. Overall, while the $5K Formula does provide you a service by giving you a prebuilt funnel and hosting it, it’s not a service that you really need. On top of that, creating a funnel is the easy part of running an online business. The hard part is getting people over to your funnel offer and the $5K Formula really falls short in that arena as it mainly focuses on using paid traffic methods. While paid traffic methods can be a great way to get people to see your offers in any online business, if you don’t know how to optimize your ads, it can cost you thousands of dollars in experimentation before you ever see a sale, let alone break even or make a profit. So, What’s a Better Alternative to $5K Formula? Building a sales funnel is just a small part to building a successful online business that you can earn money from both now and in the future. While having a sales funnel is good, there are a few other skills that you should have under your belt first. Things like building your own website and then getting people to find your site and the products that you offer on it. If you’re wanting to learn how to build a great sales funnel to use with your online business, there are a ton of places like where you can learn how to get one setup in just a few hours or over a weekend. If you’re a member of my top recommended resource (Wealthy Affiliate), I’ve even done a live training course that teaches you how to setup and track a sales / conversion funnel. Comparing Wealthy Affiliate with $5K Formula is a real no brainer as the features that Wealthy Affiliate have shadow in comparison to the $5k Formula System. Have a look at the comparison chart below so you can see for yourself. Hi there, I appreciate the honesty and clear presentation explaining the pros and cons of this product. In today online marketing world there are so many scams and bad products, it is a jungle. I am myself just started learning all about the affiliate business and I agreed with your recommendation, Wealthy affiliate is one of the best system out there, good luck to you and I hope to see more reviews in the near future. Thanks for making a review on this 5k formula it please me to say this site is a wolf in sheep’s clothing. I see nothing good here as all they do is make money from those searching for ways to make money online. highly not recommended and it’s a complete waste of time. Hi Jay, I think I know you, no, I know I know you lol. I love your webinars at Wealthy Affiliate and have learned a lot from you already. To make 5K instantly I think is just impossible, not on the internet and not if you’re not a well-known brand with a good reputation. Of course, you could sell an expensive car through a sales funnel but until you find your first customer and convince him to buy from you it takes more than an instant. I have also built my first sales funnel on my website but it is not about up-sales, I try to sell the initial low-cost product in an email series and address the different concerns a possible customer might have in the follow-up emails. I think spending money on programs like 5K Formula is mostly a waste of time. The System is not complete and won’t work for 99.99% of the users. Hi Jay – to answer your question, yes, I would like to make $5,000 online for free instantly. I had not heard of the $5K Formula, but thanks to your post I have a really good understanding of what it’s about. I had heard of the term sales funnel, but honestly didn’t know exactly what it meant. Thank you for the explanation. Your comparison of the $5K Formula and Wealthy Affiliate is very telling. There really is no need for me to persue the $5K Formula. I am interested in learning more from you and how you have become so successful. Thank you for the great information. I do wholeheartedly agree with your sentiments. As a member of wealthy affiliates, I can say from personal experience that the tools and customer support is second to none. It is design to ensure success of each member. I would highly recommend that everyone with a desire to be successful in an online business give it a try! Hello and thank you for this informative review Jay. It really helped me. I heard about this product from a friend of mine, but I was not sure what to expect. When claims like this are made, it gets me suspicious. Making that amount of money is unreal, and I know because I also blog. Making big money with your blog takes time and patience. 5K Formula is clearly not a complete scam, but as you said – you actually do not need this product. It is better to work on your own website and create your own funnels. I would also advise anyone to stay away from this product. Hi Jay, I stumbled across this review as I was searching for a training that will help me build a sales funnel. I am SO GLAD that your reviewed the 5K formula. You saved me from the video. The screenshot from the the video looks like he filmed part of the video while he was in someone’s bathroom! Granted, as a real estate agent, it looks like a very nice bathroom. Yet…. I’m not impressed by lifestyle shots and videos. How do I know that it was even his house or even his hotel room? To me that is a red flag when I am considering purchasing a $19.99 or $39.99 training package. He is trying to hard….. His going to the bank and showing that he can get $5,000 in cash is even weirder. As you said, the money could have come from anywhere. Speaking of red flags, “instantaneous” is a huge red flag also. When I see red flags like this, I worry that even if the program or training delivers on what it promises, I worry about how else the person plans to make money off of me. For example, would he be selling my email address over and over again? No, thank you. I am a member of Wealthy Affiliate. I think that my membership has been worth every penny I have paid over the last couple of years. If there are any drawbacks to their program, is that there is so much training available that sometimes I miss some of it. I will have to find the sales funnel training that you suggested. Thanks! Good article. There should be more people like you out there. Sadly, it is programs (or the less serious people offering the programs) like $5K Formula that gives affiliate marketing a bad reputation. 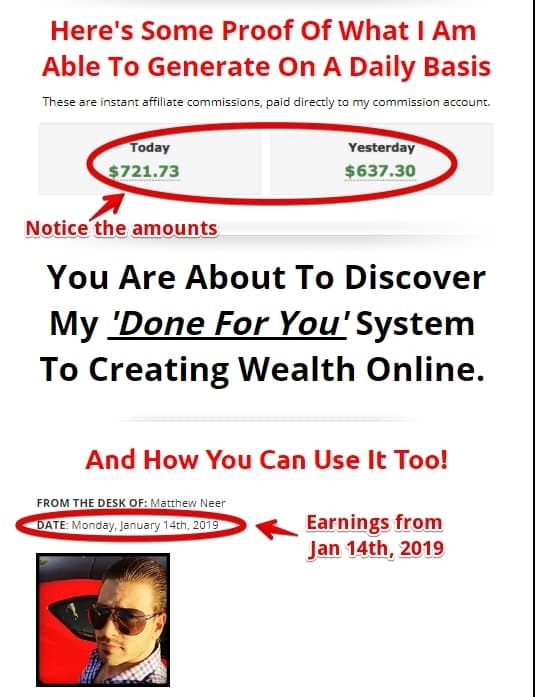 I am glad I found Wealthy Affiliates. The resources and community offered there are unique. I’m looking forward to continued training. 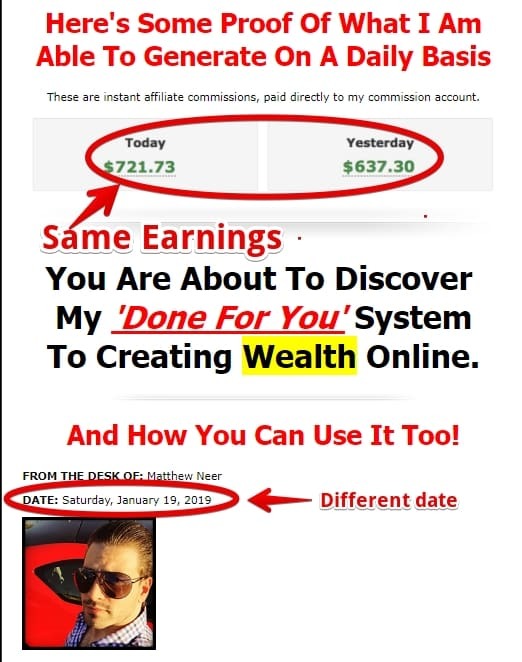 Thank you Jay for sharing with us ¨$5K formula Review¨ Let me start by saying I agree with you 100%, but looking into some of details I find it makes sense, up to a point . In other words, I am trying to take advantage of some concepts and see if it could work.The 5K formula system by Mathew Neer will give you access to some pre-made sales funnels. This can potentially work, but there are a lot of things you are not told. You will not be in control of your own business, you will not decide which products to promote, it will not just happen overnight on autopilot and it can become a lot more expensive than you are initially told. That´s the thrust of your argument and Im all for itHowever, from looking through everything on the sales page and watching the free video training you get access to if you try to leave the sales page, it is clear to see the system is built on affiliate marketing, which is a sound concept.This means you can promote products you do not own and then earn commissions. With the 5K Formula System you will do this with a sales funnel. This is the only positive thing I can say.